With this erector spinae stretch and extension, Double Impact, we start with the second part of our back stretching program. From now on, all the exercises will be of a higher difficulty than those before, so stay focused, listen to your body and stop if something feels wrong. If you are suffering from a recurring back injury, or have had a serious spine injury before, it’s best to consult with your doctor before proceeding, or just stick to the first four exercises of the program (see the list below). For all the rest, remember that with each exercise you are strengthening your core and spine supporting muscles and bring relief to your back. Lift the chest off the mat, straighten your arms at the elbows, turning the back of the hand towards the feet. Simultaneously, straighten your knees, trying to lift them as high as possible off the floor. Hold the position briefly then return to the initial position. Repeat 6 times. Keep a mental image of your body as a bow tie, in which the hands perform the function of the string. The harder you pull your hands, the bigger the flexion of your back. “Double Impact” is very similar to the previous ‘Heel Kick’ exercise. However, the fact that the hands are not used to support the body and the legs and back make more movements, makes this exercise more effective in increasing the back extensor muscles strength and endurance. Lifting both legs also creates an increased load on the abdominal muscles, which maintain the stability of the body. 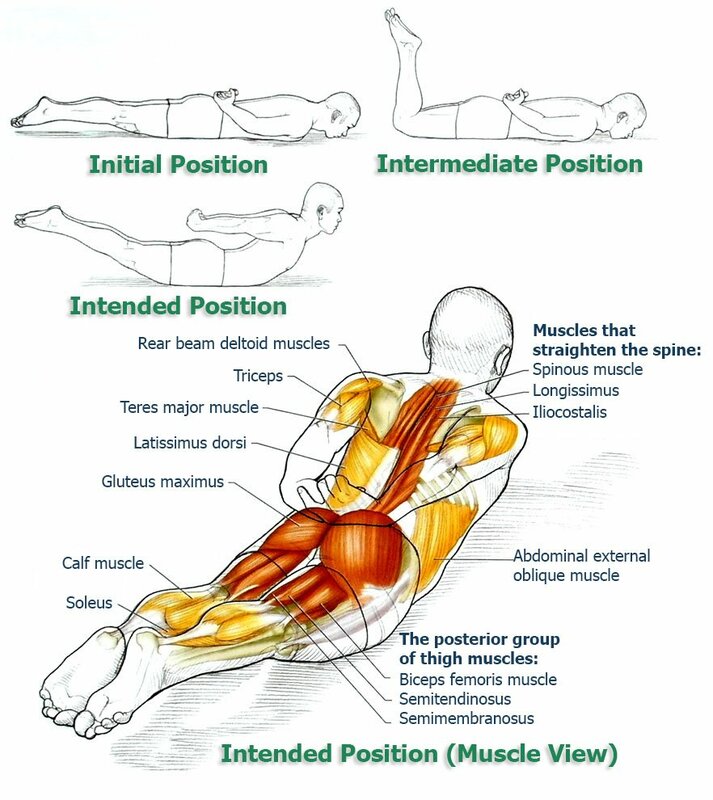 This erector spinae stretch provides a good opportunity for dynamic stretching of the muscles. It also has positive effects on your posture and will bring relief to your back. To avoid hyperextension of the neck, you can begin the exercise not with the chin on the mat, but one of the cheeks. When you start to flex the back, turn your head so that it formed a single line with the spine. When lowering the torso, turn the other cheek to the mat. To continue with our program with the next back stretch, go here.